Travel Agency Brochures are a simple, beautiful way to keep clients engaged and excited about their upcoming travels! Usage of brochures can make a huge difference between a one time client and a lifetime customer! RezSaver's marketing tools provide excellent avenues to keep in contact with clients, and the best way to do that is via brochures. For both cruise and land, the brochures come prepacked with all the details about an itinerary, with no work from the agent! Simply select the itinerary, and RezSaver does the rest. See beautiful ship photos and deck plans for cruises, and iconic photos for the destinations on a land tour. Brochures can be used as a selling tool to show clients how amazing a trip will be, or as an added benefit for existing clients. With minimal setup and maximum reward, brochures are an easy addition to any agent's workflow. 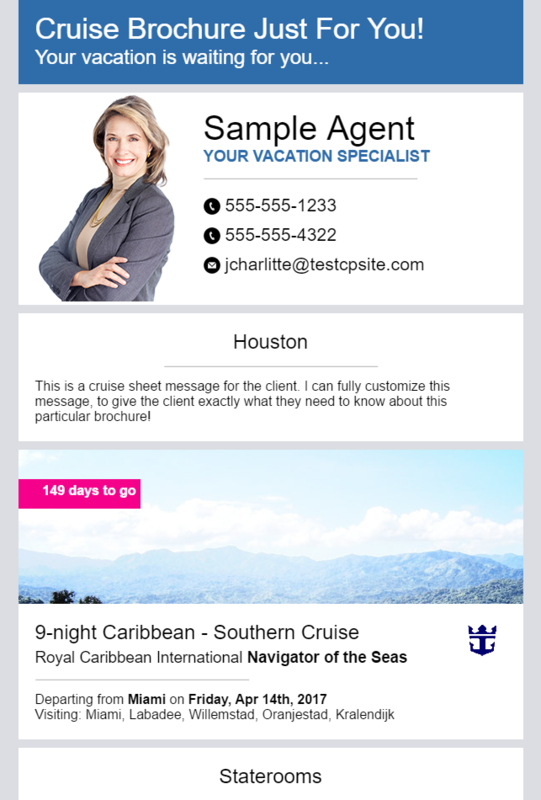 And, agents can send a single brochure to multiple clients, saving even more time! Request More Info today to see how RezSaver's brochures can help engage your clients!